"Really ... and just what is it God's done to straighten things out." "Hara kiri ... Or, as in your Kanji, seppuku." "Well ... Not a ritual suicide so to speak. Rather what Christ went through." "That crucifixion thing, right?" Yuris' head cocked to one side. "I've seen pictures ... paintings ... Just what IS THAT about?" "In the centuries after, the Hebrew people, starting with Abraham (Genesis 22) then through Issac, Jacob, later Moses and Joshua, set up a symbolic system of ritual observance in remembrance. This involved the spilling of animal blood for the covering of sin. The type of creature (Cattle, sheep, doves.) was determined by the magnitude of a particular sinful act. The ritual performed was a token gesture on the part of the sinner showing his sincerity. "Kinda like what you said about nothing we can do of ourselves no matter how hard we try?" "And that would be this Jesus of yours ... right?" Yuris' skepticism more than apparent. "Why's that?" "He being the 'son of God' qualified him for it? My aunt talked about him like that." "You hit the nail on the head, Noda." "So Jesus wasn't just a man I take it," speculated Yuri. "If he wasn't under this 'sin nature' thing." 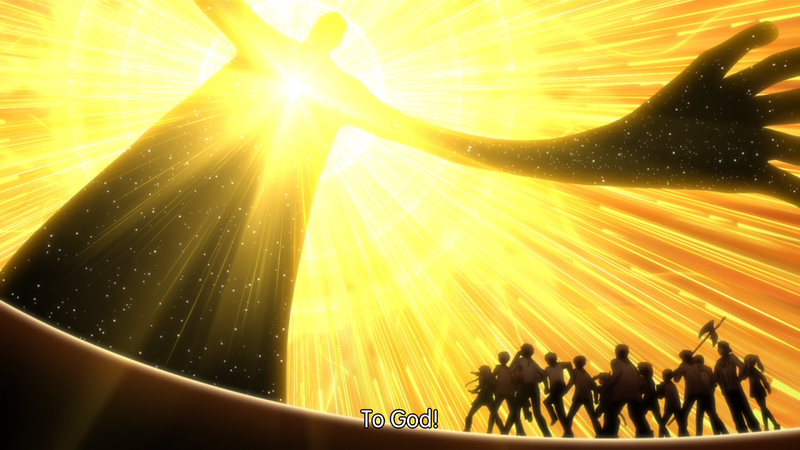 "Yuri ... Jesus was ... IS God. (Isaiah 9:6, John 8:58 and 10:30) (1) God coming in the form of man to shoulder the responsibility we ourselves can't (Galatians 1:4). Completely sinless, not under the condition we're in. It was through his death the debt is paid (Colossians 2:13-14). It's through his return from death we'll all live again one day." "So if Jesus is God ... ," thought Yuri. "Face of the enemy?" "So he had nothing to answer for? He was completely innocent?" "It was through His innocence that our guilt could be lifted." "But if he had nothing to do with the state we're in, WHY did he do it? And if so, why not just 'fix' everything else too?" His responsibility to set things right. He still had to fix what is His. The Bible mentions more than once, when there was no higher authority to answer to, He swore on Himself (Hebrews 6:13, Genesis 22:16, Isaiah 45:23). It's not in Gods' character to let things go. "If God ever did care about me or anyone else for that matter, he wouldn't have-"
"So why not NOW ... or right after he got killed and came back? Why do we have to wait ... and why here?" "Remember what I said about history being a long string of people making bad descisions?" "Free will ... as in ..."
"The way things are now ... simplistically put ... That's the way life is. That's the way it is." "Let me put it this way. And I hope you don't get the impression that I'm trying to trivialize what happened to your brother and sisters explaining this ..."
"OK. Go on." Face darkening again. "When you were little, did you ever break or steal anything? Like say from a neighbor?" "What about you Noda?" Duffy smiled. "BEFORE you came here that is." "Uh ...," the young man looked aside with a sheepish grin. "OK ... Now ... who paid the damages?" "Well ... Mom and Dad of course." Yuri answered, Noda giving a nod. "Why'd they pay for it? Because there was no way I could. Not even with my allowance." "Oh geez," Yuri thought." Noda's back in dense mode." "What about my brother and sisters killers?" "You were disciplined in some way weren't you?" "Ye ... ss. So what's this got to do with those three sick bastards? Like you say ... For all I know they're still running loose ... hurting ... Bastards! You-"
"Please ... Again ... I'm not trying to make light of what happened to your family. Just trying to make a point." Yuri calmed a bit, left hand again gripping the railing. "I'm also not trying to argue or score talking points. This is about something I'd like everyone to know about. It's important. "Did it take awhile for your parents to come up with a fitting punishment?" "About a day or two ... Got grounded ... other things." "So it's going to take awhile before those three will see justice. The world is full of those who 'got away with it'. And you're right in thinking justice delayed is justice denied ... Those three WILL pay in the end." "Won't bring my brother and sisters back." "Though your neighbor was compensated he still had to cope with the damages somehow. Just as you have to with your situation and-"
"The neighbor fixed things with the money he got from my parents, my-"
Yuri slowly turned again toward the lower campus both hands now gripping the railing. Noda, on full alert, held tightly to his halberd. For his part Jack kept a mental eye on Noda as he unobtrusively hooked his right thumb in his belt, a preliminary to drawing the .45. Jack heard the Battlefront leader curse softly. "Damn ... Damn ... this place ... "
"I don't usually tell many people this ... I had two sisters I never met. One before me ... the other after. Both died at birth. They didn't have to go through life ... through that ... this ... krap. I know it's not the same but I think I have a faint idea how you feel. You at least knew yours. I envy you for that." Stepping away from the railing, Yuri slowly relaxed. Looking straight at Duffy she remarked, "one would think you're trying to get me to disappear." "Into eternity ... OKay ... If you know so much about this salvation thing ... " She took a long pause. "Why aren't you in Heaven right now with your God?" Though it seemed his turn to grip the railing, Duffy didn't. A wry non-grin spread across the left side of his face. "That's something I've given a lot of thought about since I came here. I think I've come up with a couple possible answers." "Really? ... OKay ... ." Yuri was always looking for some light to be shed on the present situation. Maybe the past half hour wasn't a waste to her after all. Maybe this foreigner might have some insight. "The first is, if ... that's a big IF...if this 'place' is based supernaturally ... if it's 'valid' though extra-Biblical ... Then God has his hand in this. Maybe I'm being judged right now ... A trial of sorts. Who knows? Maybe this is a version of the 'valley of the shadow' the Bible mentions (Psalm 23:4, context Psalm 23:1-6). "Say if it is hell or this ... what was it? ... Purgatory ... then what?" "I wasn't what God would have me to be." The two younger looked at Duffy quizzically. "I know. From what I told you previous, you'd think I was bucking for sainthood. Heh ... Far from it. "No ... Though I had this knowledge of God ... Though I knew of his offer of forgiveness and salvation ... I just wouldn't live it." "How do you mean? After all, if you knew of what this Jesus did for you ... everyone ... why wouldn't you get to Heaven and all?" "Yes ... in spades. Salvation involves living as God would have you. 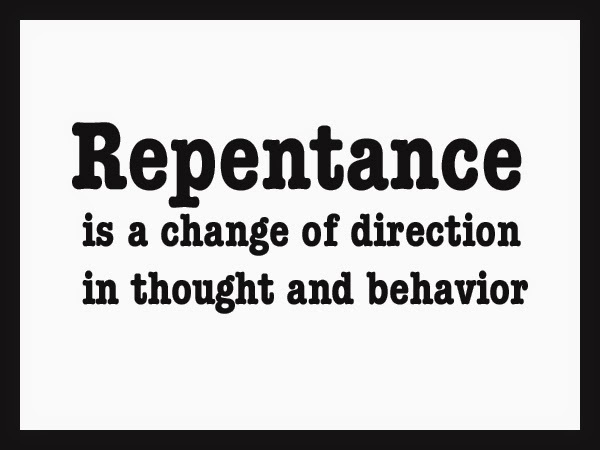 A thing called repentance. An active turning away from our sin nature ... not letting our baser selves control us. It involves putting our backs on sinful acts while countering every evil thought through prayer, faith and confidence in that God will help you to resist. Through that, one gains strength and the will to live a believers' life (Ezekiel 18:30, Matthew 3:8). "I haven't. In spite of what I know, I turned from God, living mainly for myself. Indulging in what I could afford and yearning for what I couldn't. This cut me off from Him ... The same mistake done by the first humans ... I did. The one we all do (Galatians 5:19-23). "The only explanation ... and that's all it is ... not a defense or an excuse ... Is that as a fallible human being, I do what fallible human beings do ... Being fallible. The fault ... the blame are all mine." "So what's the other explanation?" "Maybe simpler. Say I'm not dead somehow. Maybe this is a very long and detailed near death experience or waking dream I'm having. For all I know, I could be lying somewhere in a coma hashing out this ... amazing fantasy ... to pass the time. I could think up all sorts of sci-fi scenarios from secret government projects to the pharmacist messing up my prescription. "The fact the Bible doesn't mention anything like this or a 'purgatory' for that matter, leads me to conclude that this may not be supernatural in any way. "So ... You a praying man?" A large grin broke across Duffys' face. "Hon, you and that Brigade of yours-"
Nodas' snickering was cut off sharply by a soft elbow jab from Yuri. 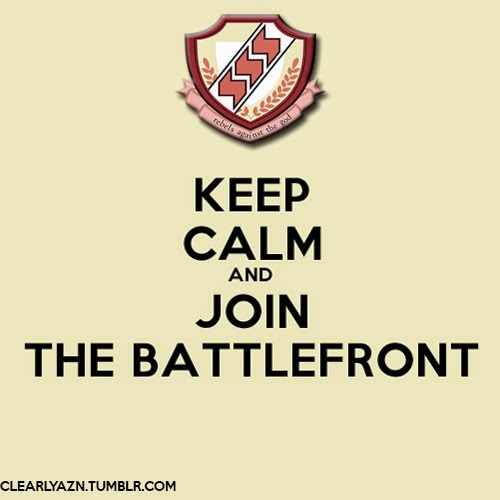 "-er ... Battlefront ... are enough to put the fear of God in anybody. When I saw you and your bunch barreling off that entrance bridge the second night I was here ... with all those wonderful toys I might add ... I didn't know what to think. Like I said, it's up in the air as to what I've been dropped into. "Right after, Angel shows up with her sci-fi weirdness ... I started thinking I was a protagonist in the middle of a bad anime that never ends." "Yeah ... Too bad we don't have an audience we can knowingly wink at." Turning in the direction of the lower campus, Duffy held his arms straight out from his sides. "Hey! ... Anybody!? ... In the audience! ... Yeah, you! ... Mind dropping your popcorn 'n gettin' your sorry posterior up here to the screen n' clue us in as to what's going on?" He could be heard below by some passersby. Two of which, Fujimaki and Oyama, looked up. "Geez! What's the crazy gaijin going on about?" Asked a confused Fujimaki. "No idea ... Yurippe and Noda seem amused ..."
The American turned back to his two conversationalists, hands hitting his thighs with a slap. "Didn't think so ... So much for breaking the fourth wall ..."
"I'm gonna ask the same question for a different reason. Knowing ostensibly why this place exists ... Why ARE you here? You don't have to say anything. A lot in the Battlefront haven't said anything personal about themselves either. It's enough to know they're with us." "No, just curious. It's not like anyone comes here without weight of some kind. You've played it close to the vest, probably for personal reasons. I respect that." Jack thought but a moment. "Remember our little discussion? The one after the break-in?" Duffy again smiled at Noda who again looked away. "I said my life had its' ups and downs. Let's just say that when I was a kid, one of those 'downs' I let affect me later in life. Led to some descisions ... regrets I'd soon not go into for the time being." "Good enough I guess. Don't wanna' talk about it ... I'll take your word for it." This partly confirmed to Yuri that Duffy wasn't here by accident or mystery. "I'm still flummoxed as to why THIS place. I certainly don't fit the demographic. The only connections I can possibly think of are minor ... I'm a casual student of history and I've some Japanese media in my vid collection. Other than that ..."
1. See also Philippians 2:5-11 and Colossians 1:13-17. 2. See also Mark 9:43, 2 Peter 2:4 and Rev 19:20. 3. The proceeding is a repeat of "the Roman road" (Most of the verses are from the Book of Romans.) from after the end of Chapter 12. This pretty much explains the plan of salvation God has provided for the individual. Of course, it goes without saying, "Go and sin no more". I really stink at this. However, one should always keep going back and asking the Lord for guidance and strength to resist (It's called prayer.). This is what's known as repentance, an active turning away from giving in to ones' baser instincts and it's an ongoing thing. Again, I would like to thank Pastor Jon Powers, Chaplain of Ohio Wesleyan University, for his input during the writing of Chapters 12 and 13 of In Gods' Good Time. In Gods' Good Time chapters 1, 2, 3, 4, 5, 6, 7, 8, 9, 10, 11, 12.